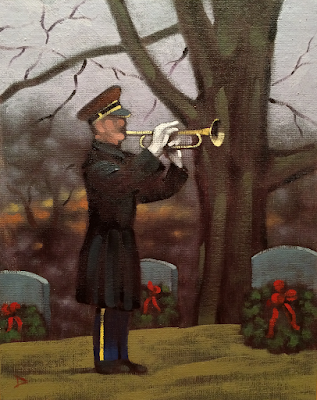 The South Boston Arts Association is proud and very fortunate to have oil painter and double amputee veteran Peter Damon as the Guest Artist for the South Boston Arts Association's June Meeting, Saturday Morning, June 11, 2016. Sgt. Damon, retired, is an exceptional artist, an oil painter, and a severely wounded Iraq war veteran. In October of 2003 he lost parts of both his arms while serving in Iraq as a helicopter mechanic in the military. The accident killed his close pal, SPC. Paul J Bueche 19, of Daphne AL. Since then, art has become a huge source of therapy for him, both physically and mentally. Peter’s website is dedicated to SPC. Bueche. Painting has given Peter a new perspective on life and he has made a promise to his buddy Paul to make the most of it. Peter and his wife Jenn recently opened a new art gallery. The 'True Grit Art Gallery' in Middleboro, Massachusetts. Peter has his own blog site/web site - http://sgtdamonsart.blogspot.com/, and has been written up in: Time Magazine, the Boston Herald, Boston Globe, Brockton Enterprise and the Middleboro Gazette. And he has been featured in the TV Documentary, “Aftermath”, The “Today Show” and “Homes for our Troops” with Phil Mickelson. As always, attendance at the Arts Association meetings is free and open to the public. Coffee, juice and muffins are served. My name is Jimmy LeBlanc. Like many of you I am an avid lover of film. I became an actor and studied in a prestigious program in Los Angeles. I have been lucky enough to appear in a few major films including Spotlight which won the Oscar for Best Picture & Best Screenplay! Now I want to pursue my real passion - making my own film. I spent two years (2008 to 2010) writing a screenplay with help from my friend and co-writer Jayson Booth. The film is a character driven drama about 5 childhood friends from my home town of South Boston. Adults now, they still run around pulling the same crap they did when they were twelve. These stick-up-kids ultimately learn a scarring lesson about their chosen way of life. A fictional story with input from friends and industry insiders whose opinions I value, the story is edgy, entertaining and most importantly it is authentic. Glenn Williams, a life long resident of Roslindale is a musician and artist who has dedicated his life to being involved in the arts and promoting the arts. His career began in the 1970’s as a member of the Arch Diocesan Youth Symphony as a classical bass player. He was the Summerthing Coordinator in the 1970’s – a City of Boston program that brought visual arts, crafts, music and performances to local neighborhoods. One of the highlights of the program was a performance by the Boston Symphony Orchestra in Fallon Field, Roslindale. Glenn and his partner Tim Casey are co-founders of LowBudgetProductions – A complete music and multi-media production facility. They have a web site at http//www.lowbudgetrecords.com. Glenn is the founder of BNN-TV "It’s All About Arts. He has interviewed over 600 artists from all media since 1997. According to Glenn, "I love being able to meet and showcase artists. Art is something that brings different cultures, different communities and different lifestyles to an even plane. Art is the only true international language. Do something artful for yourself this week." The Association is open to all, with monthly meetings taking place on the second Saturday at 9:30am at M Street entrance of the L Street Bathhouse. Please join us for some coffee, conversation and art. Please note the change of venue for this week's meeting. We will meet at the Library. Our artist/presenter wil be painter Norman Crump!